Explore the mystery of an unknown world. You've crash-landed on the Planet of the Eyes in an escape pod. Discover what lies beneath through puzzle solving, exploration, and audiologs from another survivor. 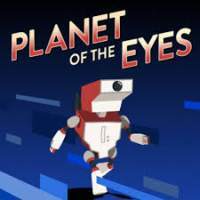 Turn down the lights, put on your headphones and grab your controller to experience the atmospheric journey of a lone robot in a dangerous world. It will keep you on the edge and test your platforming skill. With quick respawns upon death and physics-based puzzles to solve, there is a mix of challenges that rewards experimentation. Each level is uniquely crafted to present puzzles and progression through the world. With environments that tie in seamlessly with the narrative, you’ll want to explore every corner to discover the secrets that lie beneath. The game art features smooth vectors and a rich colour palette, inspired by a retro sci-fi aesthetic; with original artwork by Vanessa Chia of Cococucumber. A dark story by Will O’Neill (Actual Sunlight) will be revealed, with a full in-game vocal narration by Alex Lewis. With an immersive score by critically acclaimed musician John Black of CypherAudio, the atmosphere will haunt you on your journey through the world. With more than twelve uniquely deconstructive robot deaths, every mistake is worth making at least once.